Happy birthday, gem! 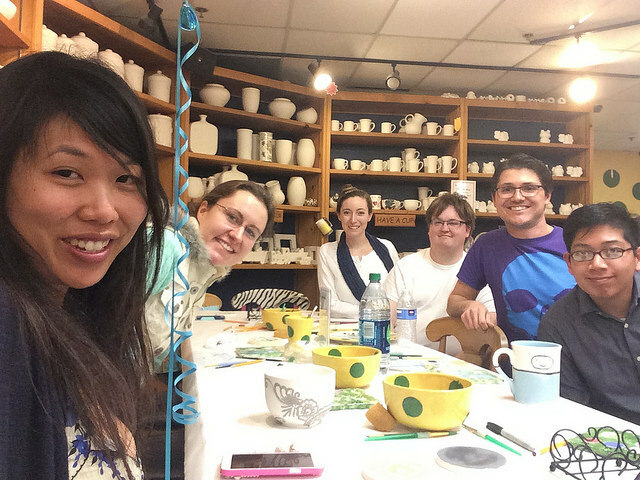 We celebrated by painting at Color Me Mine! The woman who worked there even recognized gem because we spent her last birthday there. How cool is that? She even made something based on gem’s design because she liked it so much. I painted this mug. I hope it looks good when it’s fired. It’s Jake. You knew that, right? I hope so. Wait, look at the other side! It’s Jake! Woo! Full disclosure time! I stole this idea from /u/Corrupt_Core on Reddit. We went to the Anaheim Packing District dinner, and this tip jar at the Kroft made me laugh. I had a sandwich and the pot pie poutine. So good! For dessert, I got a PopBar. Eating made me happy and sad at the same time. In the end, I was quite sad. Anyways, happy birthday, gem! Yay! This entry was posted in Art, Creations, Events, Journal, Photos and Screenshots and tagged adventure time, anaheim packing district, anaheim packing house, birthday, color me mine, finn, gem, gem's birthday, jake, popbar, the kroft on February 22, 2015 by TheUser. Yesterday was Niki’s birthday! At first she didn’t want to drink, but we convinced her. Chocolate syrup and peppermint schnapps tastes a lot like Thin Mints, you know. Niki performed the traditional birthday rites of her people by anointing her feet. No, she was actually just washing her feet in the sink. Oh, that’s not any less weird? No, no it is not. …and a carrot cake! This is just the trimmings; I didn’t photograph the actual cake. Highlights of the night include all of us playing board games, me kissing Collin’s head, Angel biting (or at least pressing her teeth against) Niki’s face, me biting Angel’s ear in retaliation, and Collin trying to bite Angel’s face in retaliation before Angel did it right back to him. This entry was posted in Events, Journal and tagged birthday, board games, cake on February 22, 2015 by TheUser. Good news! I was contacted by Pinky Verma, SEO Consultant about advertising on the Web. As it turns out, his SEO company based in India (well, he says he’s affiliated with them anyways) “has helped over 200 businesses rank on the 1st Page of GOOGLE.” Impressive. I figure he knows a lot about Google, because he uses a gmail address even! He also notes that while WebPageless has a great design, it wasn’t ranking on Google, Yahoo, or Bing (what would I do without Bing ranking?) for most keywords related to my business. I didn’t even know I had a business! Truly an exciting offer by Pinky. Wait, is Pinky a woman’s name or a man’s name? The only Pinky I know hangs out with Brain. This entry was posted in WebPageless and tagged consultant, seo, seo consultant, spam on February 5, 2015 by TheUser.